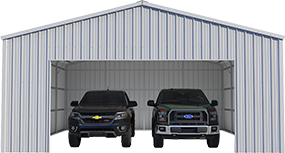 The VersaTube Summit structure features vertical sheet metal on the roof as well as the siding panels. 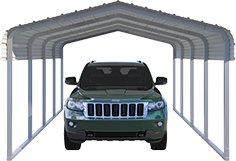 This helps prevent water or snow build-up on the roof and provides a consistent appearance. 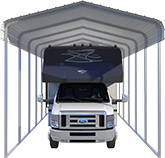 Roof purlins and side girts are included for all-around vertical sheet metal application. The mandatory side girt components in the Summit design result in a more substantial structure frame. Adding side girts may impact the foundation of your structure, so please view this foundation drawing for specific details. All VersaTube frames are created in the USA and made with only 100% American sourced, heavy duty galvanized steel tubing. By using a triple layer of corrosion protection and a mandrel bend process, we ensure our product is unmatched in both strength and durability.